The ISO 9001 and ISO 14001 quality and environment management systems ensure our dedication to achieve operational excellence. 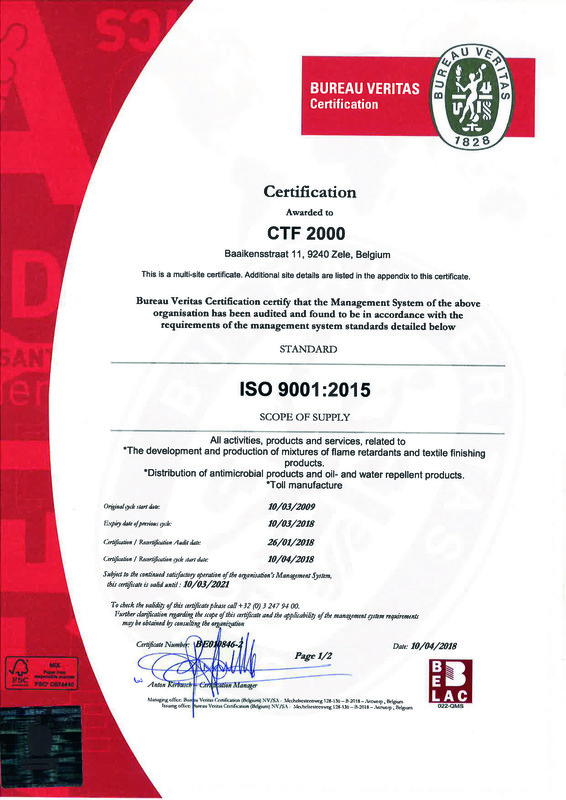 CTF2000 achieved a zero discharge statute for water thanks to its unique waste water treatment. Its efforts and investments in Product Stewardship have been awarded with a Special Commendation for the Cefic EU Responsible Care Award in 2015. CTF2000 has registered selected flame retardant products on the OEKO-TEX ® list of accepted products. Our ISO 9001 management system is our key to customer satisfaction, and to continuous improvement in all our processes. We embrace this tool to rise our system quality to a higher level, to help our people in achieving common goals and to make CTF2000 a successful company which listens, understands and answers to the needs of our customers. Our ISO 14001 management system reflects the way CTF2000 cares about the environment and manages sustainability: continuous improvement in all our processes, a zero discharge statute for water thanks to our unique waste water treatment, taking back and cleaning empty IBC’s from our customers, being a member of Essenscia’s (Belgian Federation of Chemistry) working groups concerning important European legislation like Reach, … These environmental challenges we are faced with as an international orientated chemical company concerning water, waste, complex legislation and energy are seen as an opportunity to develop environmental services for our customers, to reduce our common footprint on the planet and to create a better world for us and future generations.